This is going to be a short and sweet one from me, but I have to tell you guys about this place. 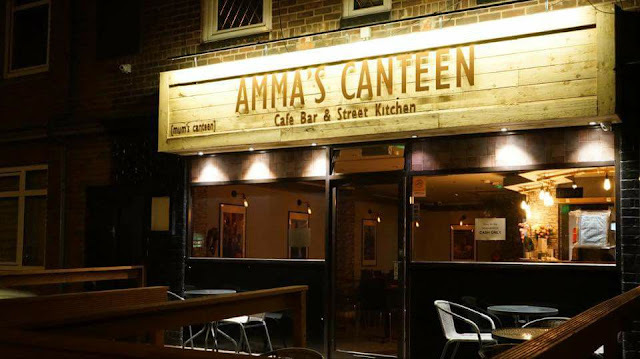 Nestled in between Chorlton and Didsbury (no man's land), opposite the massssive Southern Cemetery graveyard (stay with me, people), is Amma's Canteen. You'll have probably driven past it a few times and not really noticed it, as it's on a row of small shops, easily miss-able with a blink of an eye. I'd heard a few mumblings about the place on social, and so last Thursday, Hannah, James, Jak and I made the way to no man's land to see what the fuss was about. First of all, it's BYOB which is great, and even better when you realise you've got a bottle of unopened red from that one weekend where you managed to abstain from drinking. We went on a Thursday evening and there were about four other tables eating. It's not massive, so definitely book if there's more than four of you. 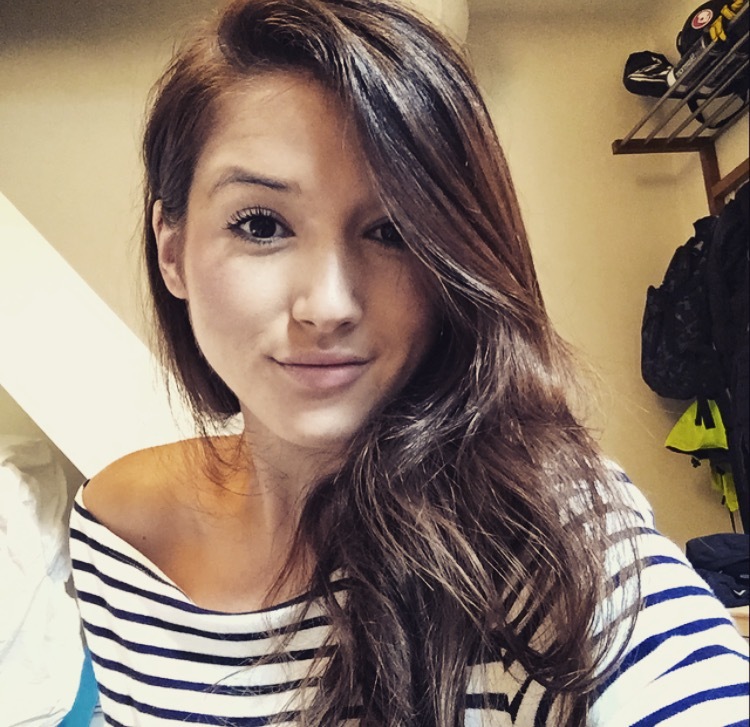 The atmosphere was very chilled and friendly - our waitress was great. This isn't Indian food as us Brits know it. It's South Indian street food serving small plates... essentially Indian tapas. You won't find any korma here, which is fine by me. I'll get straight to it, as that's essentially what we did on Thursday - we ordered pretty much everything off the street cart menu bar 4 dishes (I think there are about 14) so we had a LOT of food - but it was so delicious we polished it all off. They're great as they cater for meat eaters, pescetarians and veggies / vegans alike - there's so much choice. The emphasis really is on flavour rather than the 'meat source', which gets a thumbs up from me. Chilli paneer: The paneer was absolutely incredible. Big, chunky and a really generous portion, it came with a gorgeous sauce and lots of veggies- almost like a mini curry. Would have eaten two portions if I didn't have the rest of the menu to devour! My favourite dish..
Masala Vadai (4x pieces of falafel with a red cabbage slaw). Very very flavoursome and not hideously deep fried like some falafel can be. Spiced Sundal - slow cooked chickpeas with chilli, mango, coconut and lime; really refreshing and I loved the addition of coconut - this was a great side 'filler' dish, but if you're veggie definitely get the paneer and falafel to go with it! Chicken 65 - apparently this is a famous bar snack in Chennai - deep fried spicy chicken, really, really good! Tamarind wings - can you ever go wrong with sticky chicken wings? Beef dukka: slow roast beef, pearl onion and coconut - this was gorgeous, pulled beef with crispy veg - no sauce, but I really liked it dry. Great portion size here too. Pepper squid - I'm not a massive fan of squid, I have to really be in the mood for it, but I tried a little bit and was pleasantly surprised! Again, comes with loads of peppers and onion (a big win in my eyes!). Sauteed prawns - king prawns with red chilli, crushed shallots and coconut. These were amazing and the prawns and veggies were coated in a gorgeous light sauce. Well, you'd think after that we'd be full, but we decided to order "just three" main meals to finish us off. We ordered two dosa's (Indian pancakes) - one beef and one potato and spinach. They're massive and come with a nice dipping sauce. I'd never get pancakes as a main usually, but these were great. Jak also ordered an amazing chicken curry pot - spicy, pulled chicken pieces in a gorgeous spicy, thick sauce that was literally "me in a dish" - it came with pancakes, not rice as a side. One thing I'd say is that you really get the feeling that the food has been cooked with care, and passion - does that make sense or just sound odd? To explain a little better, the chef came out and chatted to us for a while and wanted to know where we'd heard about their place (I think he might have been the owner.. could be wrong), and explained why they'd chosen the seemingly random location. He said that they couldn't choose between Didsbury and Chorlton so chose somewhere slap bang in the middle to attract both tribes. Clever, and I bet they've saved a fair bit on rent too! It was a good 'double date' venue but I also think it would be great as somewhere to come as a group where you can all order loads of bits and share. It's a fifteen minute walk from Chortlon and probably a bit longer to West Didsbury / Nell Lane, but trust me, it's worth the short Uber ride. They also feature on a Manchester Confidential article about restaurants locals don't want you to know about - you can read it here. Their website is ammascanteen.com - check out their menu there. We'll definitely be back - Indian tapas is amazing! I'm hopefully going to do a few posts on my favourite restaurant gems, so keep an eye out for more!